Generate Contours command- How to display the Contours? The Generate Contours command creates equally spaced contour lines from loaded elevation grid data. The user can specify major and minor contour line spacing, line weight, line colors, and more. Elevation contours help the user in deciding where to place cross sections on the Map View to most effectively capture the flow area as the flow travels downstream. From the Map Edit ribbon menu, select the Generate Contours command. The Generate Contours dialog box will be displayed. The following sections describe the Generate Contours command and how to interact with the above dialog box. 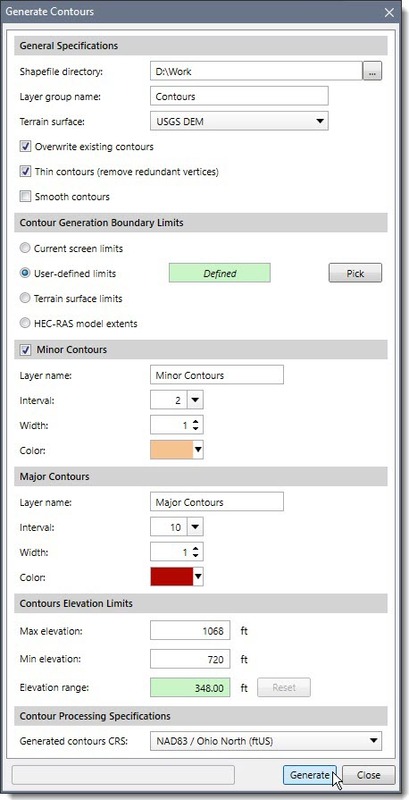 This section defines how to save the generated contours shapefiles and controls the selection of DEMs for contour generation from the available loaded elevation grids. Click the […] button from the Shapefile directory entry to specify the directory location to store the generated contour shapefiles. By default, the Layer group name is Contours and it can be changed by the user. From the Terrain surface entry, select the DEM layer from which the contours are to be generated. The Overwriting existing contours checkbox option allows the software to overwrite an existing contour layer with the same layer name. The Thin contours checkbox option removes redundant vertices that do not contribute to the shape of the generated contour polylines. The Smooth contours option controls whether extra vertices are added along the contour polyline to improve their appearance. Current screen limits: The software will use the Map View screen display as boundary limit for generating contours. User-defined limits: The user can draw a rectangle to define the contour limits. Click the [Pick] button to define the contour limits. The dialog box will temporarily disappear and an information message will be displayed on the status line. Click and drag a rectangular region to define the limits. After releasing the mouse, the user will be returned to the dialog box. A layer will be created with a rectangular box to represent the user-defined selected region. Terrain surface limits: The contours will have the same extent as the elevation grid. The user can optionally create minor contours by specifying layer name, interval, width and color. 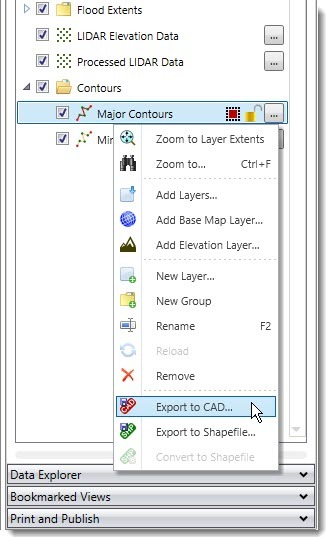 Layer name: If the user chooses to create minor contours then by default the layer name will be shown as Minor Contours in the Layer name entry and the same name will be displayed in the Map Data Layers panel. Interval: Specify the distance between minor contours. Width: Specify the line weight of the minor contours. Color: Specify the line color of the minor contours. The user can create major contours by specifying layer name, interval, width, and color. Layer name: By default, the layer name will be shown as Major Contours in the Layer name entry and the same name will be displayed in the Map Data Layers panel. Interval: Specify the distance between major contours. The value entered here is divisible by the minor interval. Width: Specify the line weight of the major contours. Color: Specify the line color of the major contours. This section allows the user to define elevation limits for generating the contours. For example, the user may not be interested in generating contours above the river valley in very steep terrain. This option limits the contours that are generated, thereby speeding up the process and making the size of the project file smaller. The user can manually type-in values for maximum and minimum elevations. To reset the contour elevation limits back to the extent of the elevation data, click the [Reset] button. The Generated contours CRS entry selects the Coordinate Reference System (CRS) that the generated contours will be created with. By default, the software selects the project’s CRS. After the contour options have been defined, click the [Generate] button and the software will generate the contours. From the Map Data Layers panel, expand the Contours group to see the details of the generated contours. The user can also export the contours to AutoCAD or MicroStation by right-clicking on a contour layer and then selecting the Export to CAD command from the displayed context menu.